December 4, 2013, 11:15 a.m.
319-338-7672 or in person at the theatre, 213 N. Gilbert St, Iowa City, Mon-Fri, 12p-4p; or one hour before each show. Janet Schlapkohl connects her personal story with key events, ranging from the local to the international, in her one-woman show, “Coming of Age in Chore Boots” [which] is heartwarming and humorous, while addressing serious issues including the plight of young men sent to Vietnam and the farm crisis of the 1980s . . . highlight[ing] how the wider world can intrude on one’s individual story, even if one isn’t attending to much beyond one’s own sphere. . . . The highlight of the first act is an extended sequence in which Schlapkohl interweaves her story of serving as a bat girl for the high school softball team with reflections on the Vietnam conflict . . . artfully contrast[ing] the battlefield of sport with the very real battlefields young soldiers encountered. It’s a beautifully written sequence that Schlapkohl performs with an appealing earnestness that nevertheless calls to the fore the high cost of war on scales both large and small. . . .
Schlapkohl had the capacity audience laughing with her portrayal of all four characters (including herself) at a monthly meeting of farm wives–a group into which she herself did not comfortably fit. Her depiction of preparations for and attendance at a department party after she and her husband returned to school was also quite funny. In between these moments, she delivered the somber story of the loss of the farm she and her husband had struggled to keep going. . . . The show is dotted with humorously employed song clips that emphasize key moments. The device is handled well, and never detracts from Schlapkohl’s own storytelling, which is, by and large, exceptional. Here is a brief YouTube trailer with Janet's description of the play. 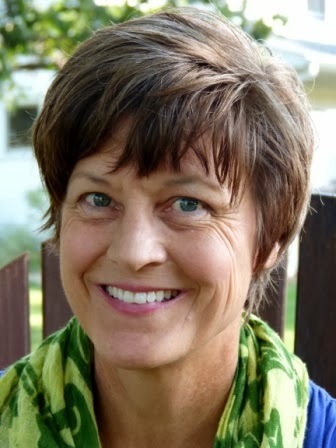 Janet Schlapkohl, writer, director and frequent Walking the Wire performer shares her memories of growing up in the Midwest. Stories both hilarious and poignant emerge—from the local characters of the Wapsi Women’s Club, back-to-the-landers and early Lamaze advocates, to Vietnam and the farm crisis. A world premiere. Janet Schlapkohl received her M.F.A. in Playwriting from the University of Iowa. She also has an M.S. in Education from the University of Iowa and a B.S. in Biology with minors in English, Chemistry, and Education from Iowa State University. She is the founder of Combined Efforts Theatre, director of Country Camp, LLC and the recipient of the Isabelle Turner Human Rights Award, the Richard Maibaum Award, and the Finkbine Award for Human Rights. She is an Adjunct Professor at the University of Iowa. Her plays have been produced in New York City, Los Angeles, Colorado, and across Iowa. She has performed her monologues and one woman shows at Riverside Theatre in Iowa City and at the Looby Theatre in Nashville. She has also worked as a Director, a Dramaturge, a Scenic Artist, and a Costume Designer. So my comments are less those of the theater critics and more in the nature of a hymn to the members of Iowa City's creative community in general and this woman in particular. One of the consequences of corporate control of art and entertainment is the creation of profit-maximizing celebrity -- the stars of TV and film, top earning music groups and graphic artists, the publicized athletes. The publisher, Alfred Knopf, used to publish worthy writers' first novels, knowing he'd lose money on them. Today's major media are primarily interested in authors whose well-advertised books can sell millions of copies, and actors whose films will gross well over $100 million. This system has served us in some ways, and it certainly has served the CEOs and shareholders of our media conglomerates ("'All the gold in California'/Is in a bank in the middle of Beverly Hills/In somebody else's name"). But it has also created a false linkage between profit and talent, and in so doing has diminished the credit of those who have every bit of the raw talent (and sometimes more) than the celebrities but none of their publicity (or income). Virtually every form of artistic creativity can be found within the population of Eastern Iowa and Iowa City -- graphic arts and sculpture, film making and television, pottery and jewelry, writing and music of all kinds, photography, and more. And Janet Schlapkohl is a major force in that creative community. "Coming of Age in Chore Boots," is only the latest example of her work. It's certainly as good or better than much of the off-Broadway theater I've seen in New York over the years, even though you probably won't read about it in the New York Times or see her featured on CBS' "60 Minutes." Janet is one of our own. As a former special education teacher at City High, she saw how beneficial theater performance could be for her students, and by 2002 had created "Combined Efforts Theater" -- "Iowa’s only Theatre Company with a mission to purposefully include actors with and without disabilities." Since then Combined Efforts has continued to grow, with ever-larger audiences, appreciative parents and actors, its own Section 501(3)(c) tax status, sprouting Men's Choir and Dance Troupes, and most recently the recipient of a Kennedy Center (Washington, D.C.) contract to teach a play writing class to local-area students, including those with disabilities. Along the way, she managed to pick up a masters in education and an MFA in play writing, while running a summer camp, helping with grandchildren, and managing a farm with her veterinarian husband, Dave. Ever since, as a small boy, I read a books about Thomas Jefferson and Winston Churchill that emphasized the wide range of their talents and accomplishments (Churchill, the book said, had once built a brick wall), I have been fascinated by such people. Locally, the former UI president, David Skorton (now president at Cornell University), was such a person. 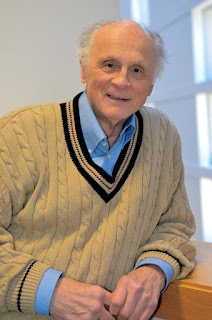 An MD who continued his practice and research, he was abundantly qualified to hold the positions he did in the Colleges of Medicine and Engineering, as well as the Department of Computer Science. He was an accomplished performer on the saxophone and flute (having worked in Chicago as a professional jazz and R&B musician), hosted a radio program about jazz, and served on the Cedar Rapids Symphony Orchestra Board of Directors -- all while functioning as a major university president. Most amazing to me was his practice of personally answering all of his email each day. (I'm currently 250 emails behind.) I could go on with more, but you get the idea. This is one of the many qualities that I admire in Janet. "Coming of Age in Chore Boots" displays a small range of her vast and various abilities. For starters, she researched and wrote the play -- one I would like to read sometime, if she would let me. It's also really good writing. Moreover, knowing her, I would not be surprised if she had more than a little to say about everything from the set design to the lighting, blocking, directing and costumes. Once on stage, she not only displays her ability as an accomplished actor, but does her share of singing and dancing, moving gracefully around the stage, and keeping us laughing -- along with, as we say, "playing all the parts," complete with accents and rapid costume changes. And don't forget, this is a "one-woman show." Have you ever tried to memorize anything longer than a sentence or paragraph or two? Have you ever had to learn your lines in a play? With other actors to work off of, and an occasional line, it's possible to memorize and get through it. But all alone? And throughout a two-act play for an hour or two? (Our Actors Equity son, Jason Grubbe, did a one-man, 90-minute-no-intermission show about Shakespeare's last day.) How anybody can do this is so far beyond my imagination, let alone ability, that I just sit there in awe when it happens. And how does she manage to turn out those plays? President Kennedy told a story about his experience as a senator, dealing with Senator Warren Magnuson, from the state of Washington. He said Maggie (as he was called) would go down into the well of the Senate chamber, where he would mumble something. Kennedy would later ask what he'd said, and "Maggie would reply, 'Oh, nothing,' and the next think you'd know the Grand Coulee Dam was built." You ask Janet, "What are you doing?" "Oh, nothing," she says; "I should start working on the summer play" (a reference to the ". . . At the County Fair" series). You see her three or four days later and she hands you a 60-page script. And it's good! It reflects considerable research. And equally amazing, when additional youngsters come along who'd like to participate, it's almost instantaneously revised, and they are written into the script with a part to play. "Coming of Age in Chore Boots" and "The Iowa Story"
So what's so special about her "Coming of Age in Chore Boots"? I've already noted that it's delightful entertainment -- funny, poignant -- a wonderful evening in the theater; a great story, well acted, with music. But that would be true of other plays she's written. This one really is her story, her farm experiences, her "chore boots." And she's really captured it. For anyone my age, anyone who experienced an Iowa family farm during any time between the 1930s and 1950s, "Chore Boots" is a wonderful, warm walk down memory lane. 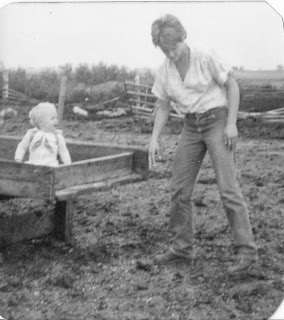 I am so thankful for being born when I was, and being exposed to life on my uncle's farm during the 1930s and '40s. It's always seemed to me there probably wasn't that much difference between Iowa family farm life in the 1930s and the 1830s -- windmills and pumps for water, outhouses and a pot under the bed instead of indoor plumbing, a kitchen stove to heat the house in winter, root cellars, literal "horse power" to pull the wagons instead of tractors, corn picked by hand, manure spreaders instead of commercial fertilizers, kerosene lanterns for light, a hand cranked milk separator. It was what we called "mixed agriculture" -- oats and alfalfa for the animals, which included horses, cattle, hogs, sheep, chickens, milk cows, and the occasional goat. Gardens provided most of the fruit and vegetables, fresh during the growing season and canned for the winter months. There were real chores -- and the boots to go with them. Kids who grew up on those farms learned how to work, rising early to do chores before breakfast and heading off to school on foot or school bus. Janet has captured this with hundreds of references, what folks were talking about and how they expressed it, acting it out, telling the story. It's a story that every Iowan should hear and know, and perhaps especially the young, who have only seen farms from a car window while speeding along an Interstate, and assume farmers have always farmed multiple sections of land, in nothing but corn and beans, with GPS-navigated tractors costing $100-500,000. 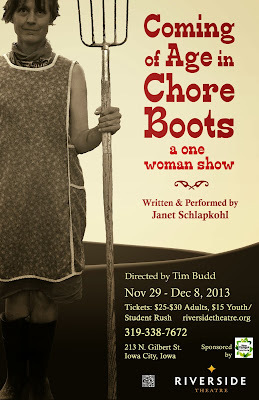 Janet Schlapkohl's "Coming of Age in Chore Boots" is the most delightful way I can imagine of hearing that story.